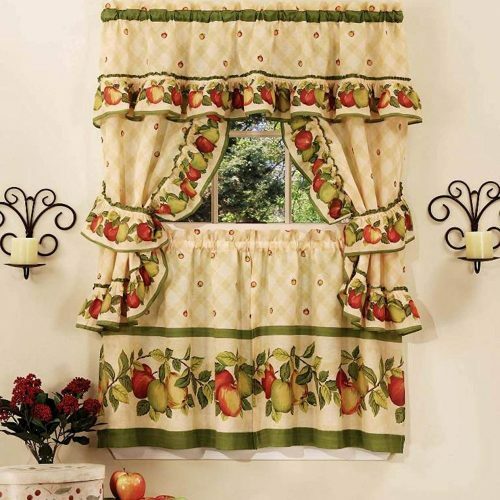 Apple Orchard Kitchen Tier Curtains by CHF Industries, add a bit of color to a kitchen with apple decor, without becoming the center of attention in the room. Pretty sheers for the kitchen with an apple lace border. The description on Amazon says that the curtains are beige, but they do look white to me. They are some shade of cream or neutral. These curtains are semi-sheer. They will give you privacy, while still letting in precious sunlight. The fabric is light and airy, and, if you use these curtains in a window with a breeze, they will billow or move in the wind. Valance insert and side swags are sold separately. 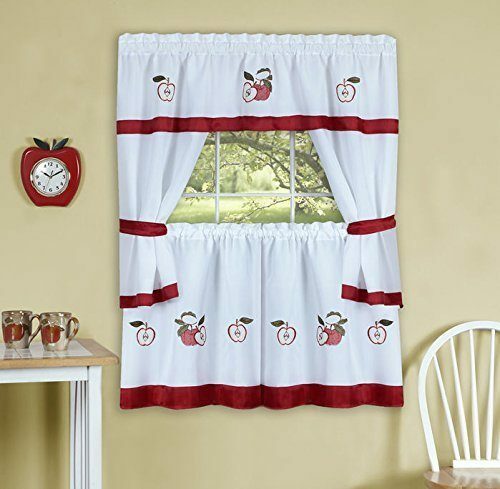 The Gala Embellished Cottage Kitchen Curtain set is a good value with its cute Red Delicious apples that are striking against a white background. Bold burgundy red borders and tie backs set off the apples and add color. This is a pretty addition to an apple themed kitchen, without taking undue attention from other features of your apple theme decor. The curtains are 58″ wide and you can get them in either 36″ length or 24″ length. Made of 100% polyester, the set is easy care and machine washable and can be tumble dried. 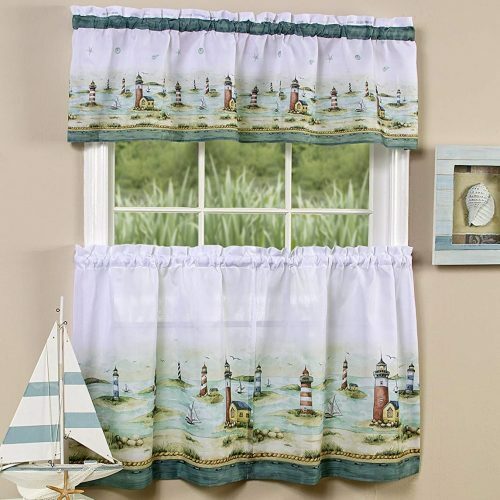 Lighthouses, sea and sand adorn these cute Hamptons Tiers & Valance set, with its lighthouses and ships along a pretty coastline. These pretty curtains will look great in a beach house or in your oceanside theme decor kitchen. 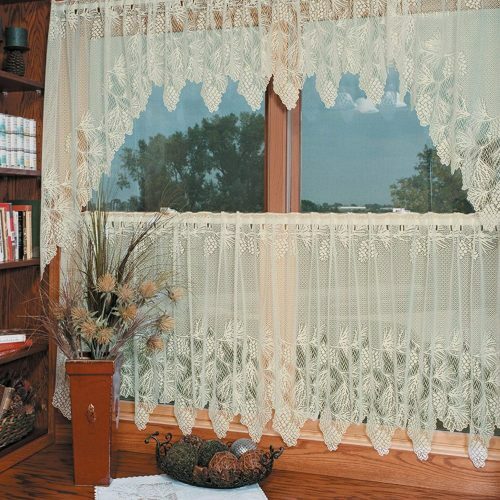 The Hamptons tiers & valance curtains are a sheer polyester, letting in filtered light, and they are unlined. Tiers come in either 24″ or 36″ length, and they are 58″ wide, with a 1.5″ rod pocket on each. Buffalo Check Tier Curtains by Achim Home Furnishings, offer an inexpensive alternative to window treatments, with a number of colors to choose from. 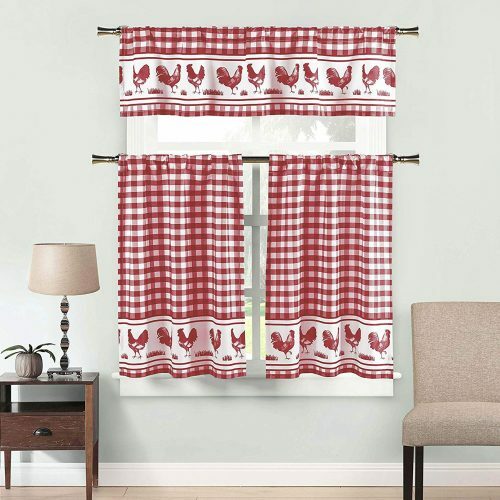 These buffalo check tier curtains work well with quite a few different themes and looks. But they all reflect a country style. The curtains are very inexpensive, so you can use them anywhere you need a little color but don’t want to spend a lot of money. I’d even use them in the windows of the garage. Available in a number of colors, you can order the buffalo check tier curtains in: burgundy red (most popular), black, chocolate brown, navy blue, sage green, or taupe. The bottom of the curtain tier panels is trimmed in a crochet-like lace. The lace is machine made, not handcrafted. Bring your love of wine and good food into your rustic country kitchen, with the Chardonnay Tier Swag Set by Achim Home Furnishings. Always popular, wine has become even more so in recent years, and these pretty curtains reflect our love of wine, wineries and the rustic countryside. 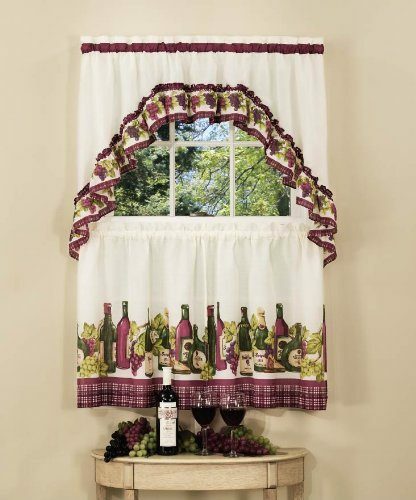 Attractive and decorative bottles of wine adorn this almost sheer curtain set. The Chardonnay Tier Swag set lets in some light, yet gives you lots of pretty color and sets the mood for entertaining and dining. The set includes 2 tiers and a swag, as shown. The dominant colors are burgundy red, green and beige on white. The curtains are semi-sheer, letting in sunlight and giving you daylight privacy. Easy care, the Chardonnay Tier Swag set curtains are polyester and can be machine washed. The Cucina Tiers & Swag set by Achim, features cute little chefs showing off their creations with dramatic flair. Can’t you just hear the little chefs singing while they prepare your dinner? I love it! 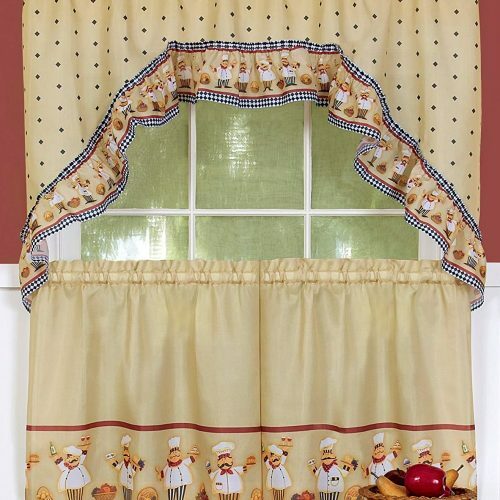 These curtains are so cute, and they would be at home in any kitchen, whether in the city or the country! The Fat Chef curtains come in 24″ or 36″ lengths, and the swag is included in the package. Machine wash and dry–perfect for a messy area like the kitchen. Sunflower Garden Kitchen Curtains, from the Designer’s Collection by Achim Home Furnishings, is a bright and cheerful addition to a rustic country kitchen. The pretty golden sunflowers will add charm and greet you happily in the morning, in your kitchen, breakfast nook or dining area. These would be a great choice for a seasonal summer curtain, helping to herald the coming of spring and summer. 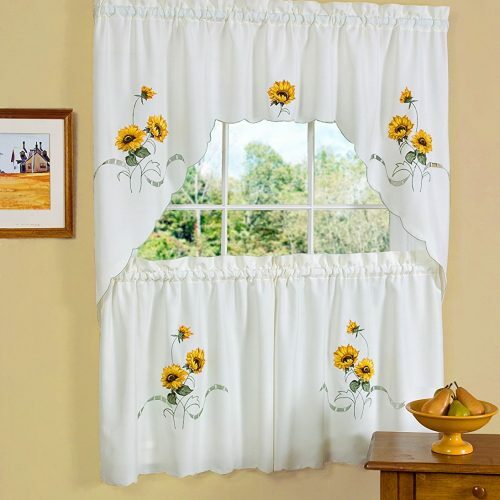 The designs on the Sunflower Garden Kitchen Curtains are appliqued and embroidered by machine. 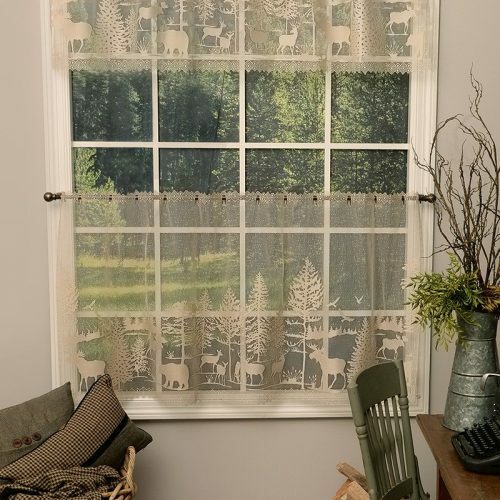 The Woodlands Curtain Tier Swag set has a pretty country scene with a log cabin, bear, deer, pine trees and a stream on a fresh and clean white curtain. Each panel features a log cabin by a stream in a pine forest. You’ll see bears in the foreground and a big buck and doe in the background. 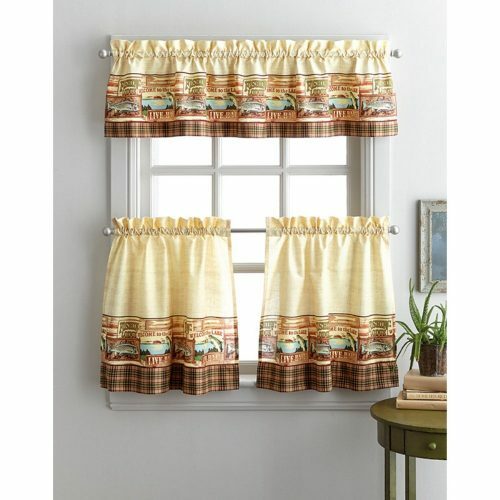 The Woodlands Curtain Tier Swag set is light enough to let in lots of sunlight, but it still affords you some privacy. Your kitchen or bath will be brighter, with a little rustic charm, with this cute set of tier curtains and swag. The Achim Rooster tier and swag set is easy care polyester and even includes tiers and swag for your convenience. These colorful roosters will add spice to your kitchen and brighten a dark window. Made of 100% polyester, the curtains are machine washable and can be tumble dried. The set includes the tiers and a matching swag with smaller roosters. Curtains measure 36″ long x 57″ wide or 24" long and 57" wide and have a 1.5″ rod pocket. 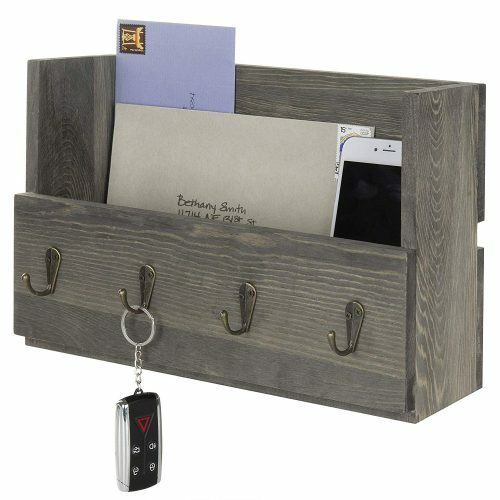 Hang the organizer next to your entryway so you'll be sure to find the things you need to take with you. These Berkshire Tier Curtains are a country sage green plaid with a pine cone print border, making them great for a country kitchen or bath. Very inexpensive, you could easily use these curtains for a seasonal change of view. They are made from easy care polyester and can be machine washed. 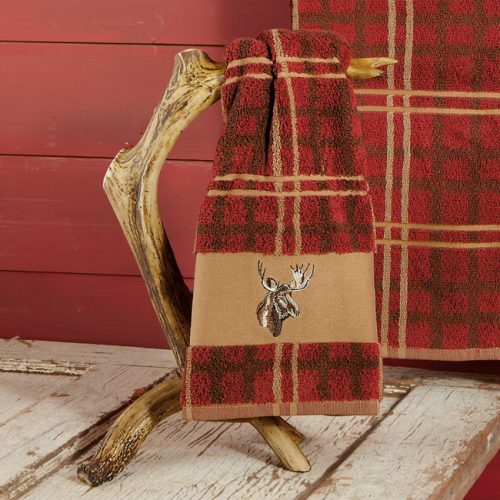 The fabric is a small country plaid, and there is an inset that sports little pine cones. The Black Bear Diamond valance, with its faux leather and scalloped lower edge, is a classy way to top your rustic bear curtains or drapes. 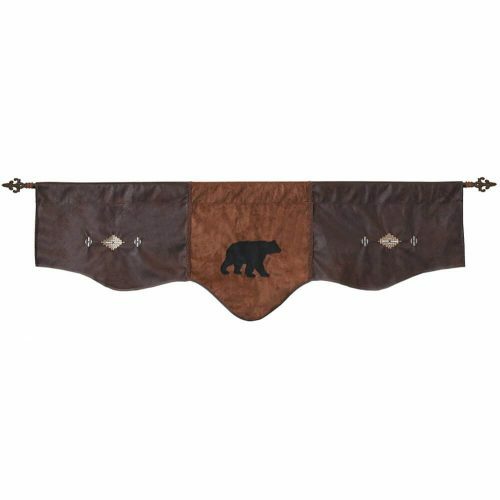 This attractive faux leather valance sports a bear silhouette and diamond accents. 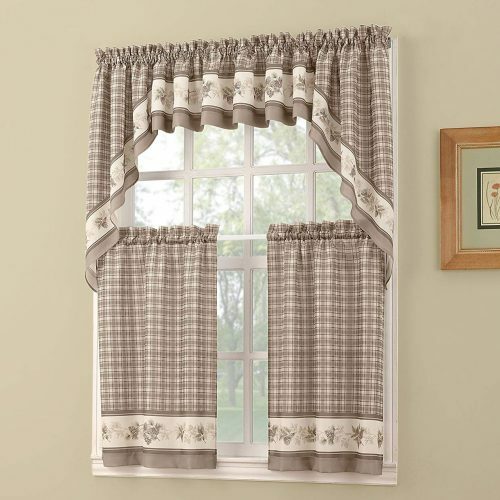 The valance is suitable for a window up to 54″. Because it is tailored (not gathered), it hangs straight and does not need extra fabric width. This valance is part of a collection, the Autumn Trails Collection. The coordinated drapes have rows of deer, bears and canoes in shades of browns, rusts, black and sage. They have a subtle western or southwestern look. The set hints of southwest styling, and would work in a rustic or southwest theme. 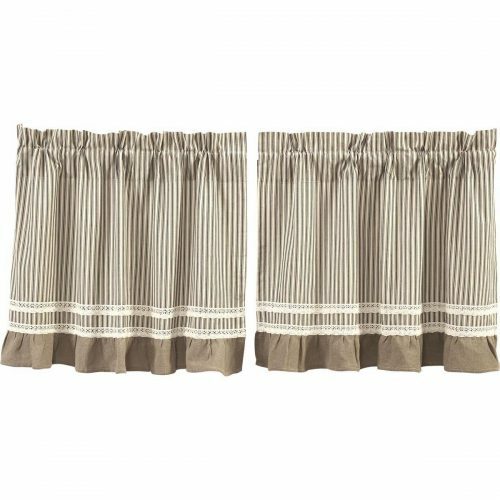 The drapery panels each measure 54″ x 84″, and the set includes the 2 drapery panels and 2 matching tie backs. Drapes are made of polyester chenille and micro-suede. Machine wash for easy care. Don’t you just love living in the country! These Black eyed Susan Tiers kitchen curtains are reminders of the wonderful flowers that you see in the spring and summer months! Lovely baskets and containers of colorful flowers adorn this bright and cheerful curtain set. The curtains are semi-sheer in that they do let light in, and they have a somewhat silky feel. Made of polyester, they are machine wash and tumble dry. When you purchase this set, you will receive 2 tier curtains and a swag. The curtains can be purchased in 24″ or 36″ lengths and the swag measures 57″ wide x 30″ long. 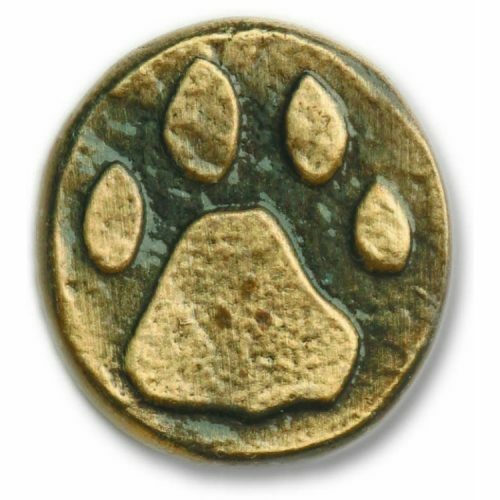 Consider the impact of using this cute antique brass wolf track knob or your kitchen cabinets or the drawers on your favorite chest! Cute as a button, the bear tracks bring your love of wolves in the wild into your home and remind you of the wilderness that so many of us love! Each wolf track knob is made of antiqued solid brass and then coated with a clear lacquer finish to protect it. The know measures 1.375” in diameter and is 1.5” high. The Buffalo Bear Valance and Drapes are eye catchers that will brighten your rustic decor and give your home a colorful lift. Bold and striking, this pretty red and black buffalo check pattern takes you to the woods with the lumberjacks. Reminiscent of old fashioned wool hunting jackets, the valance highlights silhouetted black bears. The valence measures 58″ x 14″, and it is machine washable. 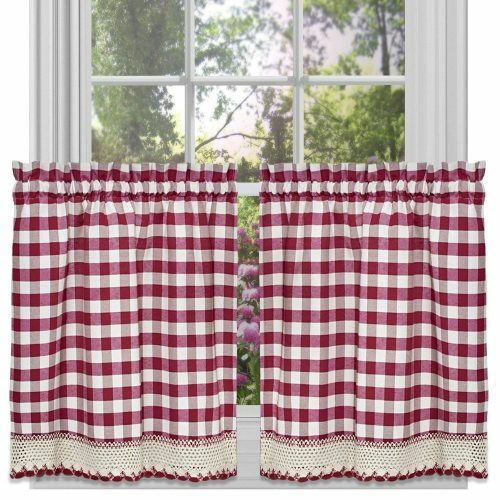 Matching buffalo check drapes measure 84″ long and 72″ wide, for a window up to 36″ wide. 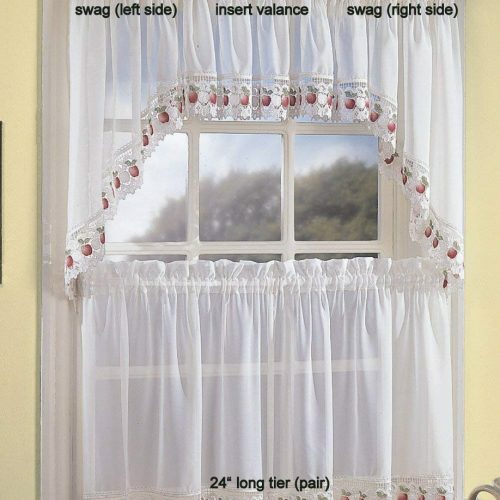 Valance and drapes/curtains are sold separately. They do not come as a set. 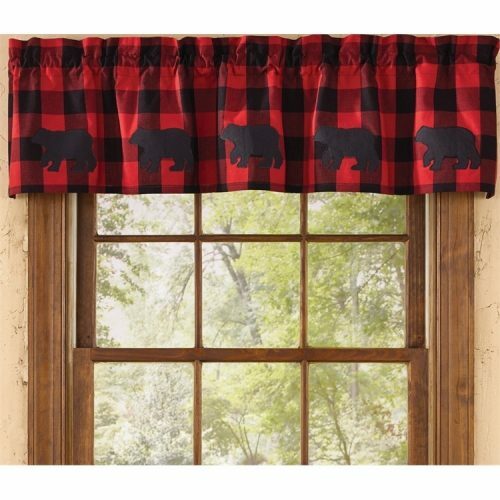 Pair it up with matching red plaid drapes or curtains, or use the Lumberjack Bear Valance alone, as shown here. These curtains are available in either burgundy or brown. 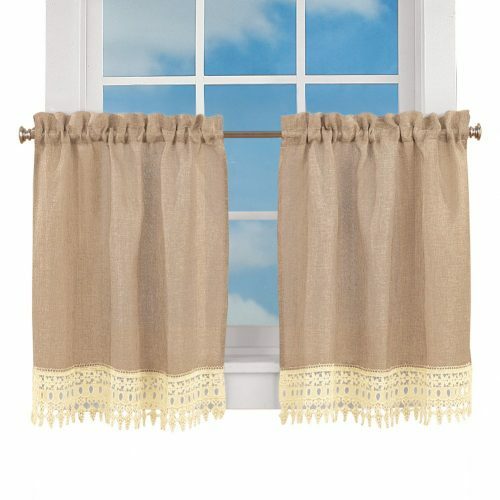 These faux burlap lace tier curtains are made of easy care polyester burlap-type fabric and trimmed with a heavier cream colored lace. Use them in the kitchen or bath to give you a county, farm house or prairie look. Because they are neutral in color, they will go with any rustic décor. They will give you privacy at night, but still let some light in during the day. You have a choice of two sizes for the tiers: 24" long or 36" long. The tops have rod pockets and will fit a standard curtain rod. Made of polyester, the curtains are machine washable. Perk up your kitchen, bathroom or a favorite piece of furniture with a cute ceramic rooster knob addition that will pull your country theme together. 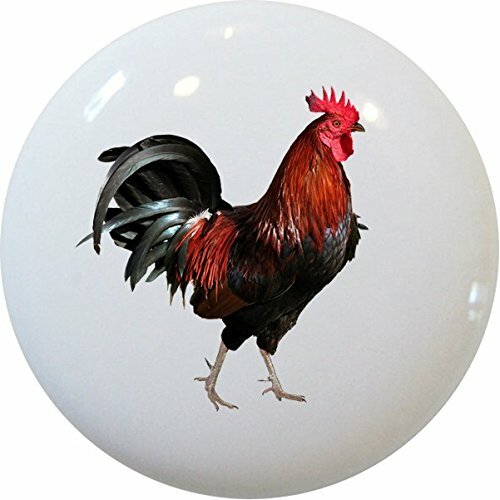 The colorful roosters are imprinted on white ceramic knobs, and they would look great on white or wood cabinets or furniture. Consider adding them to your kitchen or bathroom cabinets or even a bi-fold door in your laundry room or bedroom. Easy care. Just wipe them clean with a damp cloth. Each knob is 1 ½” in diameter. Hardware is included. Bring the outdoors into your home with style when you add the Cosette tier curtain, sheer but with a texture and pretty images of wildlife and trees. 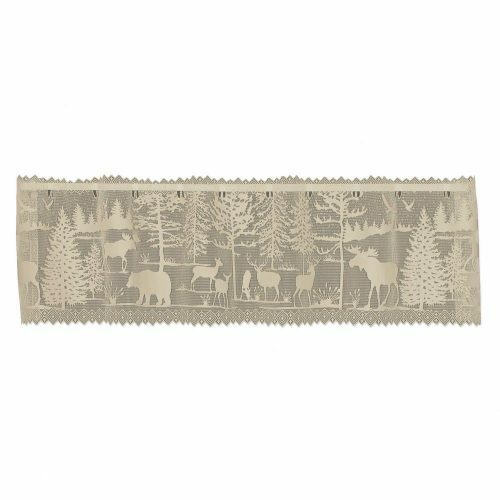 Use it alone or pair it with a Cosette wildlife valance. The curtain has rod slots and it measures 60” wide x 30” long. Made of polyester, you can machine wash it. You should not use bleach. Made in the USA. Need just a touch of softness in a room but want to preserve the view? 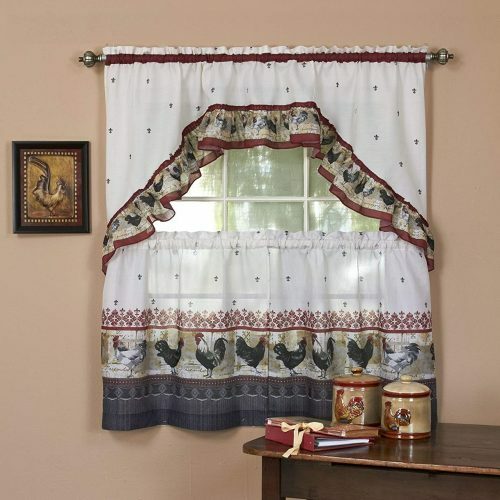 The Cosette valance curtain is sheer but has pretty images of wildlife and trees. Use it alone or pair it with a pair of tier curtains. The curtain has rod slots and it measures 60” wide x 15” long. Made of polyester, you can machine wash it. You should not use bleach. Made in the USA. 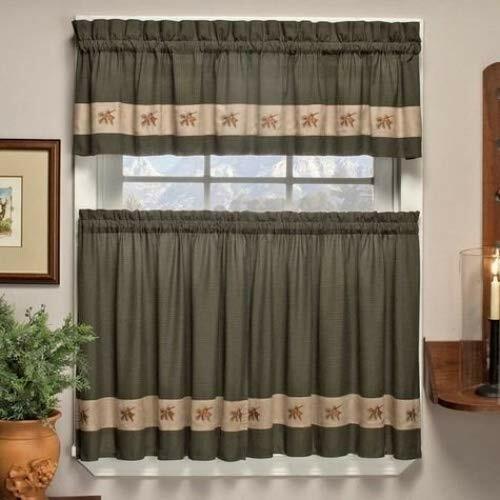 Brighten your kitchen or bath with this ivy trimmed Cottage Ivy tiers curtain set with several shades of muted greens. The background has a polka dot pattern of diamonds in sage green. For an incredibly low price, you get two 36″ long curtain tiers and the swag shown in the photo. 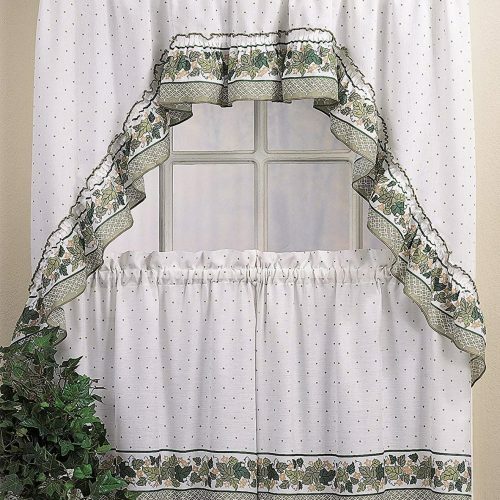 Made of a polyester/cotton blend, the curtain set is machine washable. This attractive deadwood corrugated metal cabinet for the wall is attractive in addition to being practical for cabin storage. 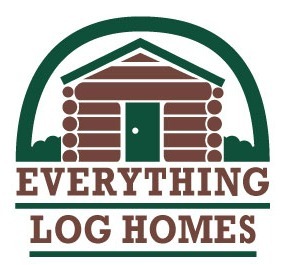 Use the shelves for extra toilet paper, cosmetics or medicines in your rustic cabin bathroom. In the kitchen, it could hold your herbs, spices and commonly used baking items. 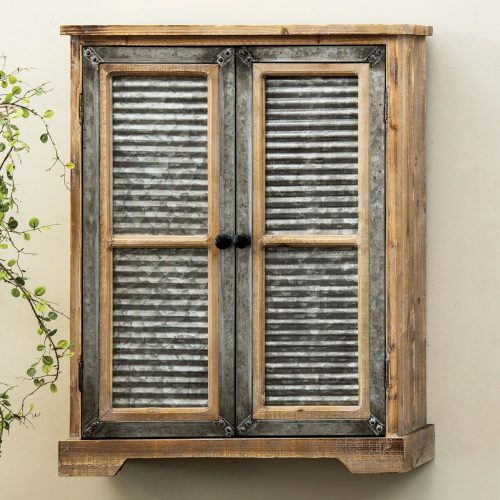 The wall cabinet is made from rustic wood and corrugated metal. It measures 21” wide x 7 ¾” deep x 27 ½” high. There are 2 fixed shelves inside. Truly a work of art by Donna Sharp, the Barn Raising Pine Cone hand quilted valance is craftsmanship at its best. You can use this as a valance, as shown in the photo, or as a table runner. Each valance has hundreds of small fabric pieces, sewn together and quilted by hand–the old fashioned way. 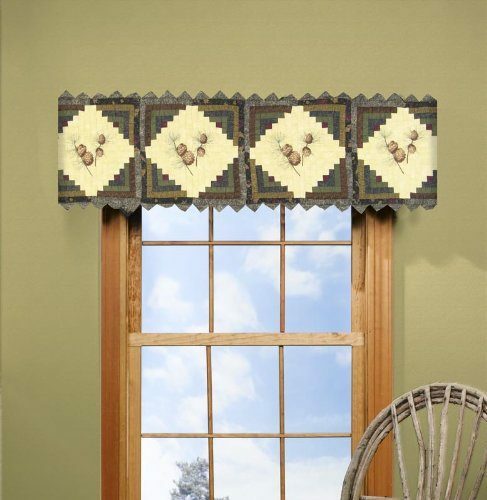 The quilting pattern is a traditional log cabin quilting pattern, and the valance has beautiful detailed embroidery. 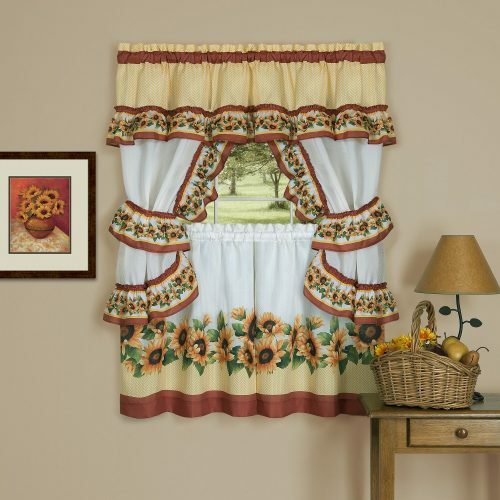 The valance measures 15″ x 60″ and is made of cotton. There is a 3" rod pocket on the back side. The fabric has been pre-washed, and the valance can be machine washed and tumble dried on low, or air dried. This embroidered rooster and hen valance caught my eye because of the cute colorful little roosters and hens on a scalloped valance. The valance has old fashioned appeal but a fresh look because of the shapely scallops. 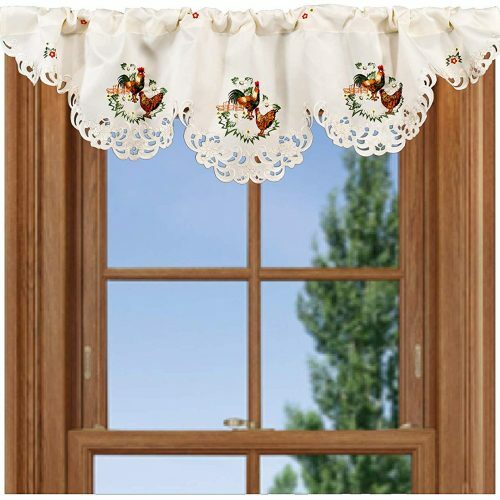 Use this valance alone or pair it with another pattern, with roosters, gingham or homespun. The valance measures 54" wide x 16" long. Easy care, you can machine wash and dry the curtain. 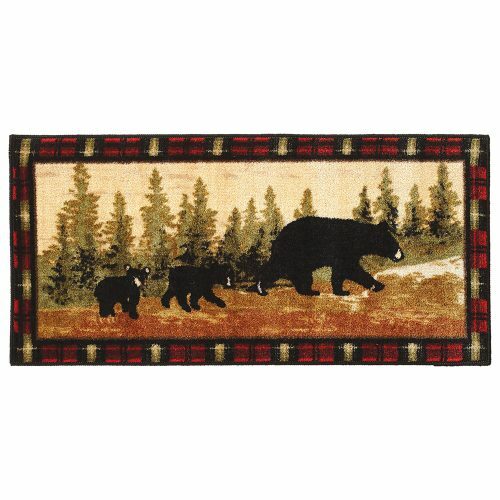 The Family of Bears rug has a mama bear with 2 cubs, sauntering through the pine woods, surrounded by a red and green plaid border. 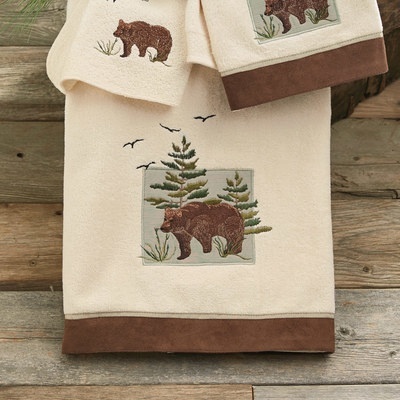 Practical in addition to being cute, this kitchen/bath rug looks great in a rustic cabin or lodge bathroom. Your feet will love its plush softness, when you step out of the bathtub or shower. It is equally suited in front of your kitchen sink. This cute nylon rug is easy care for casual living. 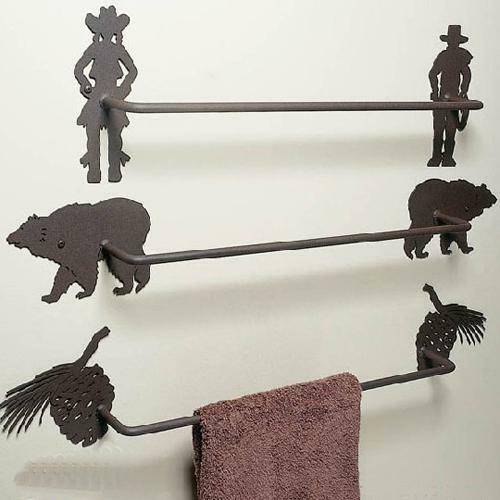 What a beautiful addition to a rustic bathroom! The Faux Antler towel stand looks authentic, as it was cast in resin from naturally shed antlers and hand painted for realism. Place this cute towel holder in your guest bath and just wait for all the comments! The towel stand measures 17 ¼” wide x 3 ½” deep x 13 ½” high. Perky and bright, this set of Loon Peak fishing lodge tiers will get you into the mood for a springtime and summer of fishing fun. Inexpensively priced, you can change your curtains with the seasons and not feel a pull on your wallet. The curtains are printed and made of a polyester and cotton blend. Easy care, just throw them in the washer and drier when needed. Each tier curtain measures 28” wide x 36” long. The valance measures 56” wide x 14” long. (There is only one length available for the tiers.) The header is 1.5” and the rod pocket is 1.5”. The curtains will fit a rod up to .75”. 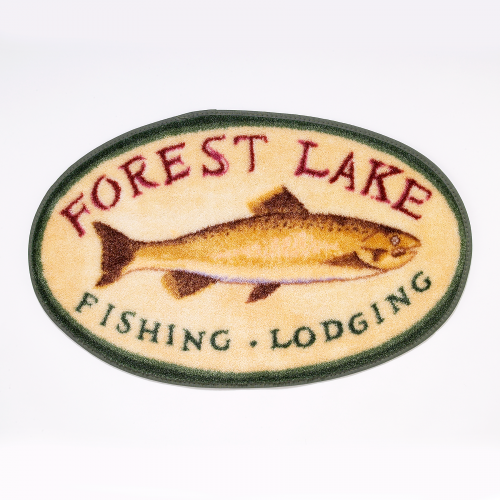 The Forest Lodge Rug features a colorful rustic print and is perfect for an exquisite log cabin or timber lodge kitchen or bath. Geometric designs are interspersed with bear, moose and evergreen forest silhouettes. Rustic colors complement Northwoods lodge themes. 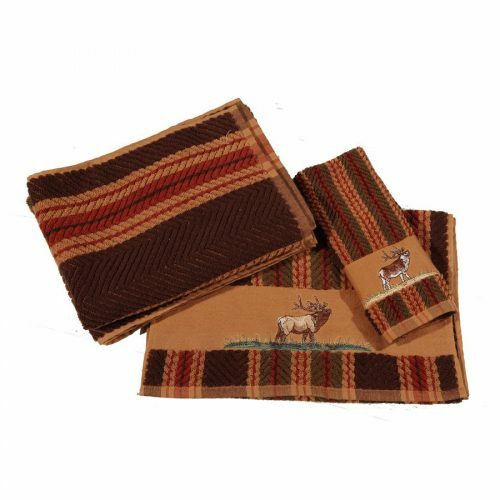 Practical and attractive, the rug can be used in the bath, kitchen, laundry or at the entryway of your lodge or rustic cabin. Easy to care for and machine washable! Rustic, rich looking and warm, this embroidered mini-plaid curtain is made of micro-suede and the curtains are embroidered with pine cones. 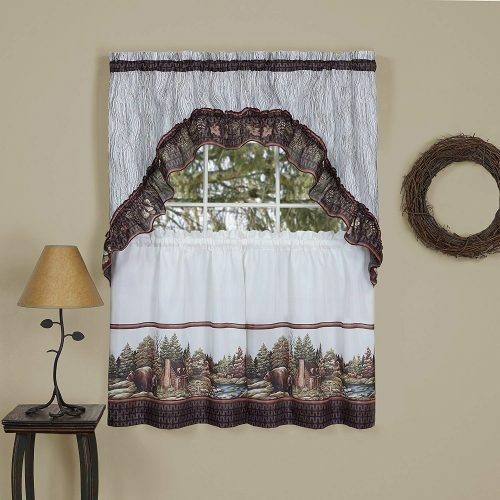 This is a pretty curtain set, made by GPD, and it has a very rustic lodge or cabin look. The fabric is heavier and is not lined. The curtains and valence are made of a woven fabric, with a very tiny plaid. If you look at the closeup view on Amazon, you will be able to see the plaid. The insert with the pretty embroidered pine cones is a polyester micro-suede fabric. Look closely and you’ll see that the embroidered motifs are pine cones. Not as delicate as some sheer curtains, these Woodland swag curtains have a pine cone and pine bough pattern, and a rustic but elegant feel to them. And, if you have a pretty view, you can still see through them in the daytime. Made of medium gauge lace, they are an ecru color and have pretty deep cutaways or scallops on the edge. The swags measure 68″ wide x 40″ drop. Machine wash on gentle cycle in cold water. 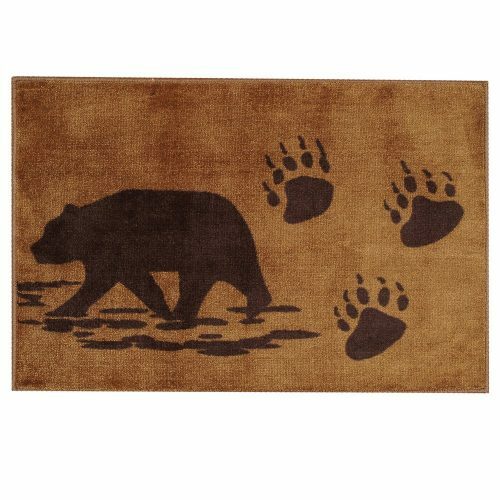 This Bear Print Bath Mat sports a bear silhouette in water, with bear paw prints. Easy care machine wash for bath or kitchen. 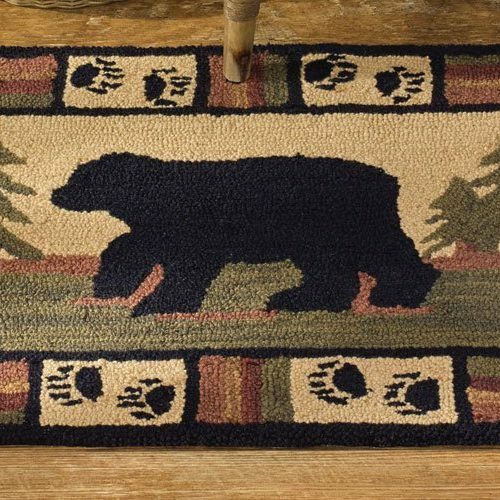 This cute bear and bear tracks rug works great in the kitchen or bath. In neutral brown tones with chocolate brown, it works well in any wildlife or outdoor theme decor. You can use this bear mat where it gets damp or wet, as it has a non-skid backing for safety. Machine washable, this is an easy care rug that you can easily keep clean. 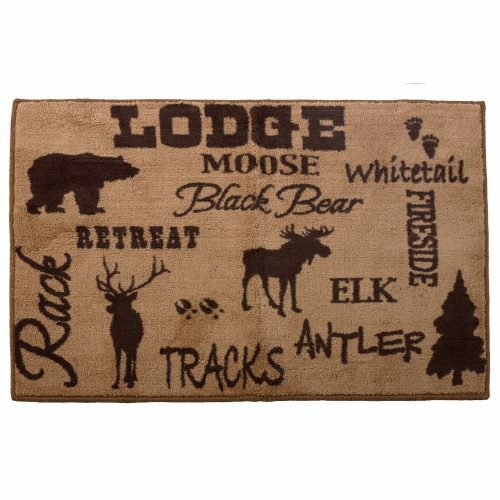 The Cabin Life Lodge Rug depicts Northwoods motifs like bears, moose, elk, pine trees and several forest themed words that jog memories of great times in the woods. With silhouettes of bear tracks, a black bear, a moose and an elk, it also has written reminders of why we spend time in the wild. 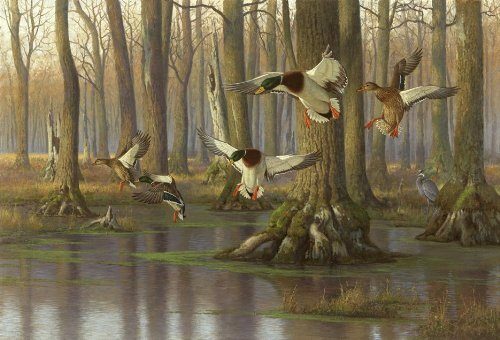 Neutral tones of chocolate and tan make it easy to use this in any wildlife decor. 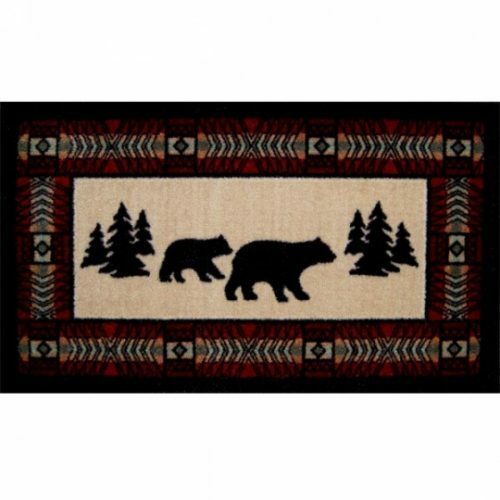 The HiEnd Accents Cabin Life Lodge Rug is soft and cushy under foot, and it has a non-slip backing. Machine wash cold. It measures a generous 24″ x 36″. 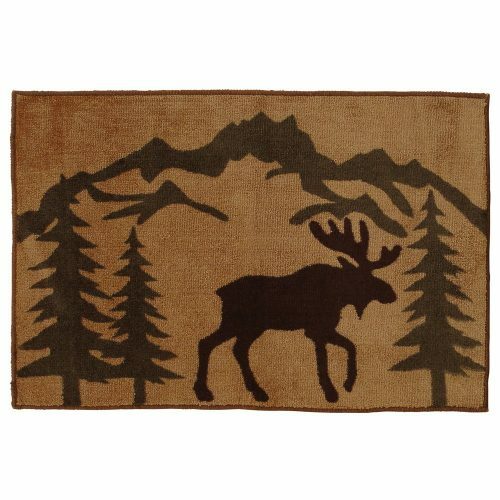 The Moose Silhouette Rug by HiEnd Accents features a moose silhouette and mountain scene, perfect for a North Woods or wildlife theme. It is reminiscent of the New England North Woods, the Michigan North Woods, the US western states, and the Canadian provinces, with their moose and other wildlife. 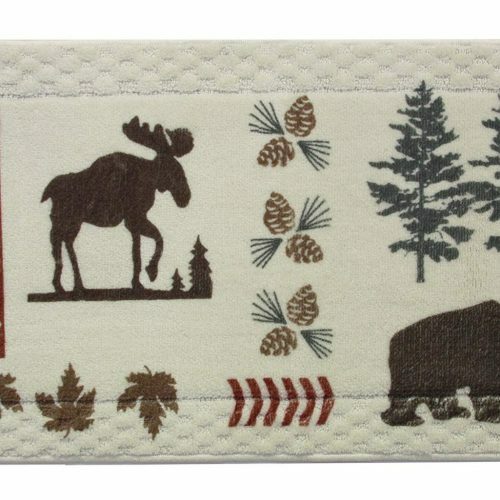 The design on this darling moose kitchen/bath rug is simple, almost primitive. And the colors are also earth tones, with shades of brown, green and black. 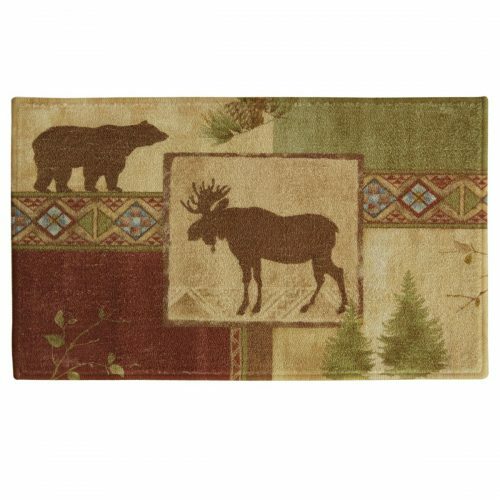 The Moose Silhouette Rug is over-sized, measuring a full 24”x 36”, plenty large to place at the exit to your shower or hot tub--or at your kitchen sink. As with the other kitchen/bath rugs that we feature, this one has a non-skid backing and is completely machine washable. 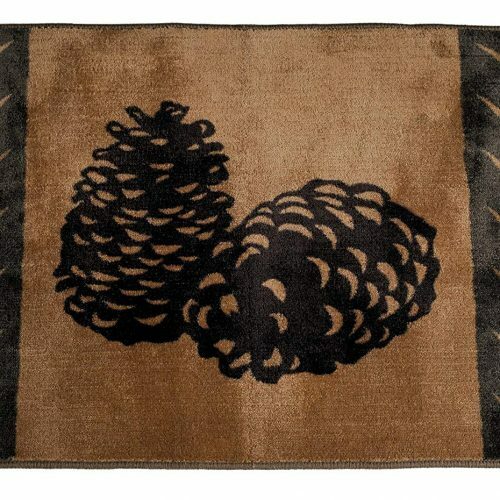 This pinecone kitchen-bath rug, simple in design and machine washable, fits perfectly with any outdoor or wildlife theme in a rustic log cabin. Two large pinecones and pine branches adorn this charming pine cone bath mat. Because of its simple outdoor design and its neutral colors, you can pair this cute pine cone rug with just about any outdoor theme decor. The pinecone kitchen-bath rug is over-sized, measuring a full 24”x 36”. With its non-skid backing it will be safe to use where you step out of your shower or tub, as well as in the kitchen . The HiEnd Accents pinecone kitchen-bath rug is easy-care, and is machine washable so that you can keep it nice. 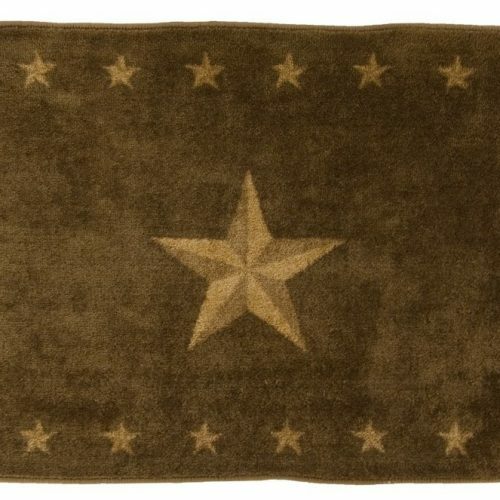 The HiEnd Accents Western Star Rug makes a great addition to a western theme kitchen or bath, with its dark chocolate background and it two toned tan stars. A nice quality rug, this star bath rug feels luxurious on your toes, yet stands up to being vacuumed. 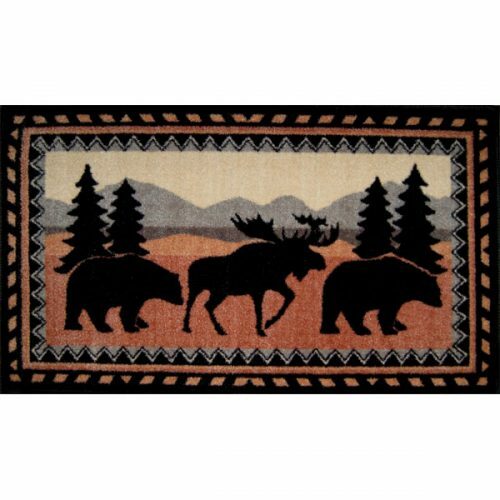 Looking for a classy western rug for your cabin or lodge? This rich looking dark chocolate star rug will certainly complement your western theme. Completely machine washable, this western accent rug works well as a bath mat in the bathroom or use it in the kitchen in front of the sink. Neutral browns make it easy to use this area rug in a number of decors. And the two toned stars have a 3-D effect. Made of 100% polyester, the rug has a non-skid rubber backing. The Western Star Rug comes in 2 sizes: Small (24″ x 36″) and Large (24″ x 60″). 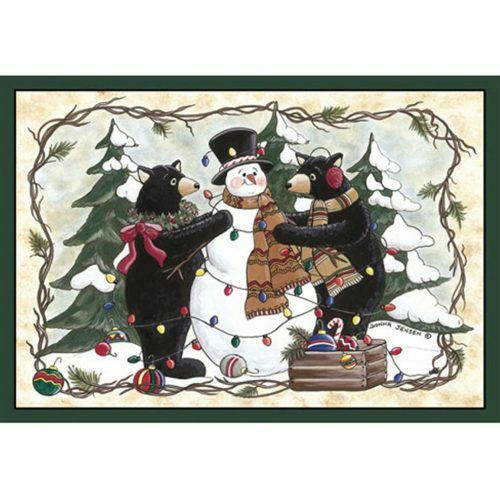 A whimsical and fun holiday rug, the Home Accents Bears and Snowman rug has happy black bears placing Christmas lights on a snowman friend. While it’s not exactly traditional, it is a fun way to share the holiday spirit with their special friend, the snowman. 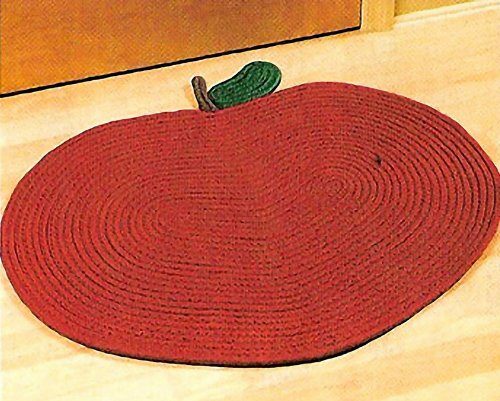 Your kids will love this rug, and so will you. Add a little fun to your holiday preparations, and enjoy this rug, season after holiday season. The rug is bound on 4 sides, giving it strength and a pretty border. Hypoallergenic, the rug is also odor resistant, anti-static and lead free.